Several Pearlgate Club members will compete at the McGill Open II this Saturday, February 19, Montreal, QC. Athletes will be accompanied by coach Becky Sjare and manager George O'Brien. 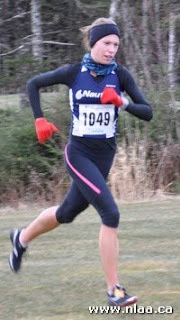 Kate Vaughan (Nautilus Running Club) of St. John's will travel with Canadian national team to Trinidad and Tobago for the 2011 North America, Central America and Caribbean (NACAC) Cross Country Championships. The Championships will take place this Saturday February 19. Kate is set to compete in Senior Women 6km race. A field of more than 170 athletes representing 16 national federations will compete on February 19 at the seventh annual North America, Central America and Caribbean Athletic Association (NACAC) Cross Country Championships at Port-of-Spain, Trinidad and Tobago. Cross Country running is both an individual event as well as a team sport. At the NACAC Championships each country can enter a maximum of 6 athletes per race (Junior, Senior / Men, Women) with the individual placing of each country's top 4 runners included to accumulate a team score. The NACAC Championships will contest races for the open men's 8 km, open women's 6 km, junior men's 6 km and junior women's 4 km.